Yesterday was a big day at our house. 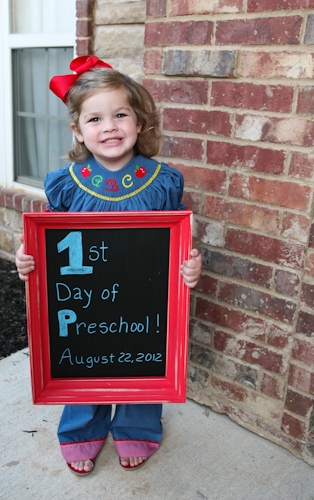 Harper started preschool! I can't believe she is this old! and Hollis started Mother's Day Out. I learned pretty quickly that Harper does better with structure and being around people so she is just happier when she can be "in school". 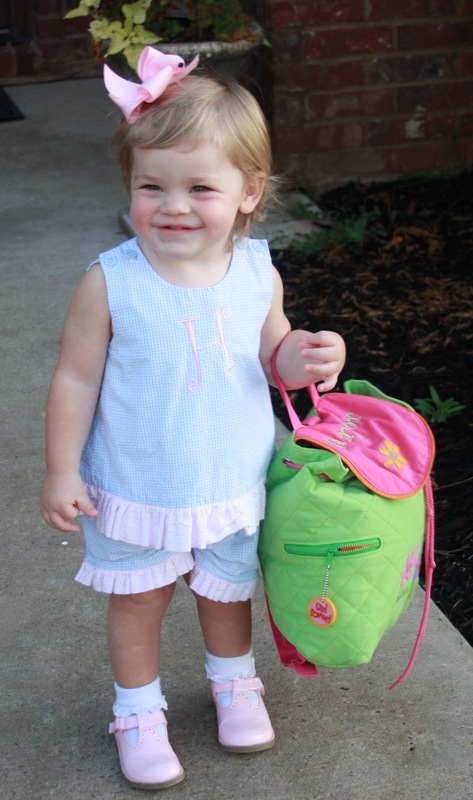 So even though I love having her home - I love seeing her soar as she goes to school. And I saw what a help it was to her when she was Hollis' age - so I thought I would try Hollis too. Hollis has never had separation anxiety - she is pretty happy go lucky and she really likes playing with other kids so I like to give them this. And if you read my past post - you know that this gives me a break and a chance to get organized and clean and run errands and keeps me from coming "unglued". I'm just a better mother when I get a few hours away and then when I'm with them - our time is happier! Why does she look so big? The chalkboard is a total Pinterest Idea that I loved. I hope she will still hold it in 10th grade! :-) Read to the bottom to see how you might get a similar chalkboard! This was her first day of MDO 2 years ago. It seems like yesterday. I was barely pregnant with Hollis at the time! This girl just kills me. I don't think she could get cuter if she tried. Hollis' teacher. 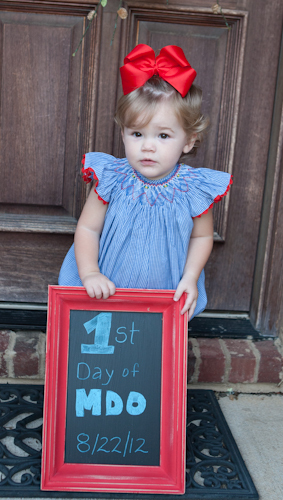 She is so sweet and I know Hollis will have the best year. She is in with just a few kids and we know every one of them which makes it very special. Harper got a wonderful teacher and I'm so excited for her year. She loved it and told me she was ready to go back! I have a sweet friend that lives here who is in the process of adopting from Ethiopia and they have started an etsy shop to help raise money for the adoption. They made the cute chalkboards for me and they can make all kinds of things. I am going to giveaway one chalkboard (it can be any color)! It would be cute anywhere in your house or for parties or to use like I did in pictures! Leave a comment on this post and I'll draw a winner on Friday night!